The Nursery | One Room Challenge Week 5 — Stevie Storck Design Co. I'm a little late getting my week 5 update up, but progress on the nursery has been chugging along! 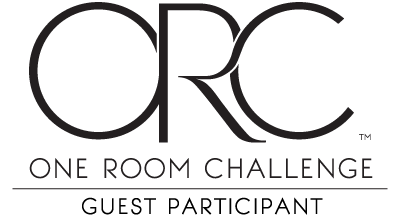 (If you're just joining in now, you can see my previous One Room Challenge posts here: Week One | Week Two | Week Three | Week Four.) Over the weekend, we got all of the supplies we needed for the picture rail and spent time figuring out the exact placement on the wall. Because the ceilings aren't level in our old house, we picked a spot we thought we liked and then Anthony went around the room with blue painters tape and a level to see where it hit on the other walls. We had a busy weekend and beginning of the week, so it wasn't until Thursday night that we were able to start hanging the trim. And by we, I mean Anthony. At this point in the One Room Challenge (and my pregnancy, I'm 36 weeks now!) he is doing 98% of the work. I am so grateful for him, because to be honest, he's way better at DIY than me! Even if he's never done something before, he figures it out. Whereas I'm an impatient, instant gratification type (good for painting, not so much for finish carpentry) he takes his time and does a much better job that I ever could. Basically, he's the best and the only reason we are going to finish this room in time for the big reveal next week. THANK YOU ANTHONY! Here are a few iPhone shots of Anthony installing the trim last night. I "supervised", aka sat in the rocking chair and wasn't helpful at all. As I'm writing this post, I'm lounging in our nicely air conditioned bedroom while Anthony is working on cutting and hanging the rest of the trim. He pops in and out of the room every few minutes, on his way to the balcony turned DIY workshop off our master bedroom. The goal is to finish the trim and caulking tonight or tomorrow so I can paint it and get everything ready to hang the wallpaper mural. This week I did finish framing the artwork (in an eclectic mix of thrift store frames I got in week 3), got the last pillow cover in the mail, and we picked up this vintage mirror to hang over the settee from a lady on Facebook Marketplace. It's big and round with a beveled edge and a really pretty etched design. I think it's going to be perfect! So here we are! Only 4 days left to finish the room (so I have time to photograph it and get a blog post ready for the reveal on Thursday) and we're almost there! Anthony's feeling pretty confident but I'm in a mild state of panic. Cross your fingers for us! If you want a peek behind the scenes as we wrap up this last week of the One Room Challenge, I've been sharing updates on Instastories! As always, you can see the week five updates from the 20 featured bloggers below and the rest of the guest participants here. Thanks for following along!